Almost a year ago, Campsite’s fully automated buying platform, specialized in out-of-home inventory, was launched in Canada. Now, on the tail end of our first year in the Canadian programmatic buying market, we’re proud to launch Canada’s first open exchange totally dedicated to Digital Out-of-Home. As of today, all campaigns running on Campsite will compete for inventory through a Real-Time Bidding (RTB) model and will be automatically sent to supplier screens via API. 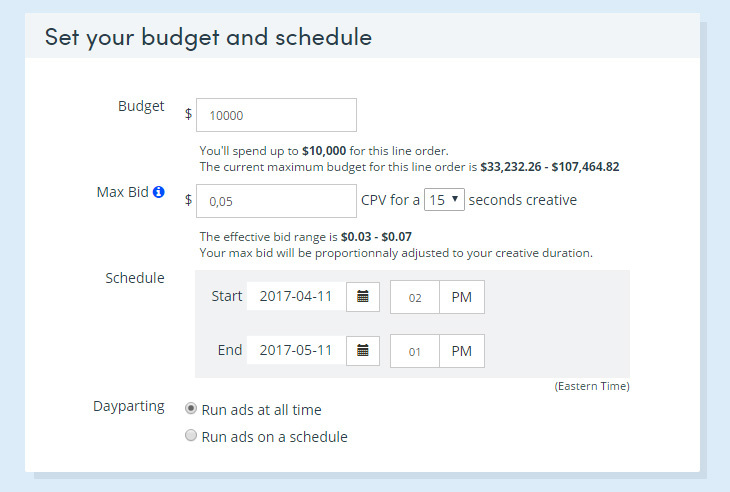 When creating a campaign, buyers will set a maximum bid for a 15 second (or other length) creative on a Cost Per View (CPV) metric. Auctions will occur every hour and Campsite will automatically deliver the best result at the lowest price. Campsite provides customers with an effective bidding range: the minimum range is the supplier’s floor price and the top range is an approximation of where previous bids were won. 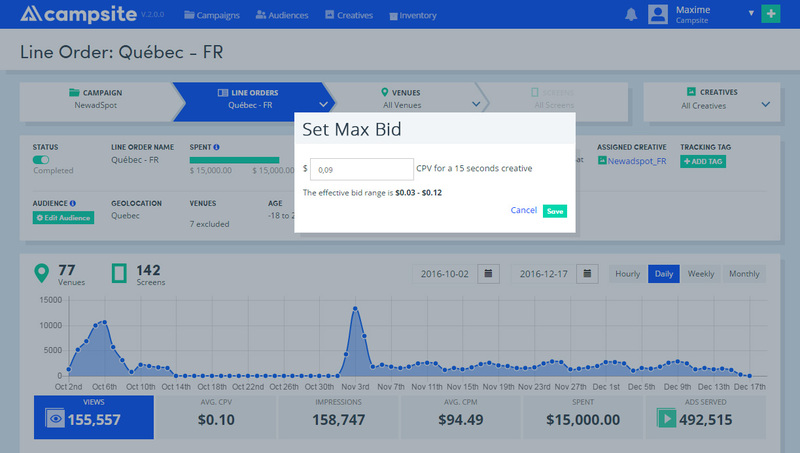 The buyers can change their maximum bid at anytime in the reporting and optimization dashboard. What does it mean for suppliers? For those familiar with Google Adsense, Campsite for Suppliers (our SSP) works in a similar manner. Suppliers simply offer their available inventory and collect revenues on that unsold inventory. There is no need for them to actually make a sale by creating a deal ID. That means it opens up the immediate possibility to generate revenues for suppliers, as there is a growing list of active buyers connected to our DSP searching for increasingly more DOOH inventory. Additionally, Campsite for Suppliers allows suppliers to set a (minimum) floor price on their network, venues, screens and products, on which buyers will be bidding later in the process. For now, our exchange exists solely in API form, accessible from a DSP or an SSP through a real-time bidding process. The simplest way is to log into the Campsite DSP or Campsite for Suppliers (SSP). Both platforms are completely free to use. Our products are designed to work seamlessly together, but they are also designed to work independently. Hence, there is absolutely no problem if a supplier wants to connect to our exchange with another SSP or if a buyer wants to access our exchange with a third party DSP. What is a DOOH exchange? It supports DOOH core concepts. By way of example: every time a creative is broadcasted in a College cafeteria it reaches 10 students. In a web situation, when a student sees an ad, it's one bid request for one impression meaning it's a “one-to-one” scenario. This is a fundamental difference from a DOOH situation where every time an ad is requested, it reaches multiple eyes, so it’s a “one-to-many” scenario. Our DOOH exchange is specifically designed to handle advertising in public places as opposed to single users, or one personal device at a time. Context and Geo Data: Environment, Venue, Screen, Location Type, Lat / Long, Address, Image, Dwell Time, etc. All the DOOH targeting: Gender, Age, HHI, Demographic...the list goes on. In other words, when a supplier integrates their inventory in our SSP, all relevant information pertaining to their network is sent through our exchange and used in our DSP to define the available inventory, targeting options, reported metrics, and all other particulars regarding the campaign. All of this data must be exchanged otherwise it creates a bottleneck where only limited information can be passed to buyers.This results in a situation where buyers and suppliers are forced to communicate campaign details, targeting and/or reporting outside the platform, slowing down the whole process. The easy access of this DOOH data makes buying more transparent and allows buyers to be more strategic. Making additional venue and audience targeting data available helps media buyers understand OOH environments better and ultimately create campaigns that are extremely well-adapted to their environment and the audience they are reaching. With Campsite, all aspects of the buying process are automated through the platform, allowing clients to plan and execute campaigns in a matter of minutes. We believe that these feature will rapidly become familiar and contribute to building the best practices possible for DOOH inventory and the DOOH industry. Montreal and Toronto, May 16, 2017 – Campsite Global Inc. announced today that PATTISON Onestop, Canadian leader in Digital Out-of-Home (DOOH) media sales and operations, is the newest supplier to offer its inventory on Campsite. The magnitude of this new alliance makes the programmatic media-buying platform a must-have solution for any advertiser looking to maximize its digital investment strategies. Now that Campsite is wrapping up its first year, its a great time to share the results seen by the first vendor to connect its inventory to our platform. Indoor advertising leader Newad has had their unsold digital inventory available programmatically through Campsite’s DSP since May 2016. Here’s an overview of their journey.